Several University of Evansville students made presentations at the Research in Gerontology Symposium held March 26. 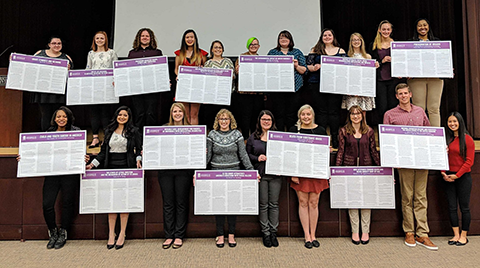 University of Evansville sociology seniors, as part of their senior seminar course, completed their Major Field Tests and scored in the 97th percentile among comparable institutions. Congratulations on this accomplishment. Mari Plikuhn, University of Evansville associate professor of sociology, presented a paper co-authored with Kevin Gray, UE associate professor of criminal justice and sociology, titled, "Principles and Principals: Using Reflective Narratives to Inform Curriculum and Recruit Majors" at the annual meeting of the International Society for the Scholarship of Teaching and Learning, in Bergen, Norway, on October 25. Conference travel assistance was supported through an Eykamp Center for Teaching Excellence Teaching Conference grant. Hannah Wehr, a junior majoring in sociology, presented a research paper co-authored with associate professor of sociology Mari Plikuhn titled: "Attractive Traits in Potential Mates: Similarity and Gendered Preferences in Social, Physical, and Personality Characteristics" at the recent Annual Meeting of the Indiana Academy of Social Sciences. Collaborators for research design and data collection were: Bre Engle (CJ/SOC '18), Mackenzie Kochell (CJ/SOC), Oli Ross-Musick (creative writing '18), Melia Schnefke (theatre management '18), and Katherine Williams (business '18). Research construction and data collection for this project were completed as a course project in SOC 371: Love and Attraction during Fall 2017. Mari Plikuhn, associate professor of sociology and director of the Eykamp Center for Teaching Excellence, has published a chapter, entitled: "Courting Controversy and Allowing for Awkward: Strategies for Teaching Difficult Topics." The chapter is part of the new edited volume, "Learning from Each Other: Refining the Practice of Teaching in Higher Education," set for release on August 10, from University of California Press. The Indiana Alpha chapter of Pi Gamma Mu, international honor society in social sciences, welcomed six new members at their Induction Ceremony on December 7. The newly inducted members are: Hunter King, Sylvia McFadden, Justine Moore, Hunter Sandage, Bailey Schnur, and Blake Simmons. In addition, the chapter’s new president, Sylvia McFadden, and new vice president, Bailey Schnur, were inaugurated as officers. University of Evansville assistant professor of philosophy Lisa Kretz is attending the Society for Ethics Across the Curriculum conference. She will be presenting on the University of Evansville’s new ethics and social change major, the only one of its kind in the United States. On Monday, August 14, Rob Shelby, assistant professor of sociology, convened a session on religious change at micro, meso, and macro level at the Annual Meetings of the Association for the Sociology of Religion in Montreal, Canada. Shelby also presented his paper, "The Spread of Modern Megachurches in the U.S. from 2005 to 2013." Rob Shelby, University of Evansville assistant professor of sociology, was recently interviewed by the Evansville Courier & Press about national trends in church mergers. Part of his interview was featured in an article in the paper’s March 8 edition. Mari Plikuhn, University of Evansville associate professor of sociology, will be the speaker for UE’s Andiron Lecture on Wednesday, February 1. The lecture, which is free and open to the public, will begin at 4:00 p.m., in Eykamp Hall, Room 252, in Ridgway University Center. The topic of Plikuhn’s lecture will be “Alpha Scholars and First-Generation Families.” Students who are the first in their families to attend college represent a growing presence on college campuses nationwide, yet research on concerns and challenges their families face with their college attendance is virtually non-existent. During her talk, Plikuhn will present information from a study that bridged this gap in research by examining family experiences of 400 first-generation college students. 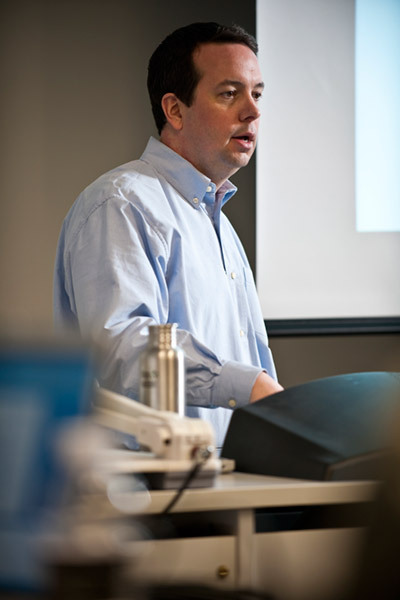 Plikuhn is associate director of UE’s Eykamp Center for Teaching Excellence. She was named the University of Evansville Outstanding Teacher of the Year in 2012 and currently serves as the Governor of Indiana for Pi Gamma Mu, International Honor Society in Social Sciences. She earned her PhD and MS degree in sociology from Purdue University. She also earned MS degrees in sociology and marriage and family therapy and a graduate certification in survey research from Purdue University Calumet. Her area of research specialization is in family sociology, specifically in the successes and challenges of first-generation college students. The Andiron Lectures in Liberal Arts and Sciences series is sponsored by the William L. Ridgway College of Arts and Sciences and supported by a generous gift from Donald B. Korb. For more information, call 812-488-1070 or 812-488-2589. The University of Evansville’s annual Andiron Lecture Series begins October 5 in Eykamp Hall, Room 252, in Ridgway University Center. UE associate professor of archaeology Jennie Ebeling will be speaking on “It Takes a Village: The Realities of Directing an Archaeological Excavation in the 21st Century.” A social hour with beverages precedes each lecture at 3:45 p.m. The lectures are free and open to the public. University of Evansville professors Ralph Larmann and Mari Plikuhn were honored recently with the Sadelle and Sydney Berger Awards for service and scholarly activity. The two were presented with the awards by Charlie Berger during UE’s Fall Conference. Larmann, professor of art, was given the Berger Award for scholarly activity. He is very involved with the publication of educational texts, and is the co-writer of Gateways to Art, the best-selling art appreciation text in the United States. It has been adopted at approximately 400 universities and is required reading for many programs. The London Times called the book’s third edition” one of the best books of 2015.” The London Times also featured it in a full-page review. Larmann is also an accomplished artist. His work is often displayed in exhibitions at such prestigious galleries as the Swope Art Museum. His work “A Neighborhood of Citizens United” was accepted for exhibition in the Swope’s 69th Annual Wabash Valley Juried Exhibition and received a Nancy and Fred Nation Award of Recognition. In 2014 he exhibited as part of the ENW Exhibition that celebrated the opening of the renovated Evansville Museum. Plikuhn, associate professor of sociology, was given the Berger Award for service. During her time at UE, she has worked tirelessly to serve the University and her department. She is Grand Marshall for UE’s commencement ceremonies, and co-chair of the Ceremonies Committee. She is also a member of the University’s Faculty Senate’s curriculum and athletic committees. In addition, Plikuhn serves as faculty advisor for the Society of Social Research and the Pi Gamma Mu Honor Society for the Social Sciences. She is a department representative for UE’s Open House academic fairs and academic sessions. Plikuhn serves as an advisor for the Major Discovery Program and is part of the Student Success Team. Kevin Gray, associate professor of sociology in the Department of Law, Politics, and Society at the University of Evansville, was named the 2016 Outstanding Teacher at the University during UE’s 158th Commencement Exercises on May 7. Gray came to UE in 2005. He earned his undergraduate degree from Spring Hill College in sociology, his MS in criminal justice from the University of Alabama, and his PhD in criminal justice from Michigan State University. He maintains academically rigorous classes and continually updates his courses. Gray serves as advisor to all criminal justice majors and supervises internships for criminal justice and sociology majors. As a member of the campus community, Gray serves as chair of the University’s admissions and standards committee. Gray was nominated for the Outstanding Teacher of the Year award not only by students but also alumni, faculty members and administrators. Those nominating him described him as a brilliant and witty teacher who has a genuine interest in his students. His teaching style was described as both entertaining and challenging. Matthew Knoester (assistant professor of education) and Mari Plikuhn (assistant professor of sociology) have published an article entitled "Influence of Siblings on Out-of-School Reading Practices" in the Journal of Research in Reading, the flagship journal of the United Kingdom Literacy Association. The article has been published online and will appear in print in an upcoming issue of the journal. Paul Klein was awarded the Hanns G. Pieper Senior Research Award in Sociology and Criminal Justice for his senior research project entitled, "Binge Drinking in College: Peer Influence on College Students' Drinking Behavior"
The honor is awarded annually to a Sociology or Criminal Justice major, chosen by the program faculty, for his or her outstanding research. The award is named for emeritus professor, Hanns Pieper, who developed and taught the Sociology research sequence at UE for over 2 decades. The Department of Law, Politics, and Society congratulates Paul on this accomplishment. Mari Plikuhn, assistant professor of sociology, and Elizabeth Long, junior sociology and psychology major, presented their paper, "When the Baby Never Comes: Stillbirth, Miscarriage, and Social Support" at the annual meetings of the Midwest Sociological Society in Kansas City, Missouri, on March 27. Long also presented her single-authored paper, "Intersexuality and Feminism: Who Will Fight for the Intersex?" at the MSS meetings. Senior criminal justice majors scored in the 99th percentile of comparative institutions on the CJ major field test. Senior sociology majors scored in the 98th percentile of comparative institutions on their major field test. The Society for Social Research welcomed nine new members at its induction on Thursday, March 27. New members are: Chelsea Clifton, Mackenzie Gammans, Sabrina Kordes, Jenna Koschmeder, Elizabeth Long, Mallory Mooney, Tyler Plogher, Arwen Plunk, and Calli Pugh. Senior anthropology major Stephanie Underhill was awarded the 2013-14 Hanns G. Pieper Sociology and Criminal Justice Senior Research Award for her research entitled, "The Effect of Residential Background on Oral Health Attitudes and Perceptions." This award is given annually to the outstanding independent research project conducted, written, and presented by a major in sociology, anthropology, gerontology, and criminal justice.